Elite Soccer would like to share with you some comments and feedback we have received. Many thanks to those who have commented. i would just like to say what a great time Gavin had on your soccer school at Highdown we will be booking him again can you give me the dates of future courses?alsoi think its really good that that you break the day up with your mega slide,bouncy castle,shoot out game ect, it adds extra fun to an already fun packed week. please can you pass this on to your coaches who i thought were very professinal and aproachable at all times. Hi our Son has just attended the Elite Soccer holiday club for the first time at Highdown School this week. Glyn was very understanding as it was the first time Joe had attended anything like this as he is only 5 so we didnt want to book the whole week ,so Glyn kindly suggested that we book day by day,Joe ended up doing the whole week and couldnt wait for the next day he really enjoyed his week and we have now booked him in for next week! the following week we are on holiday and Joe now saids he would rather go to soccer school again,sorry Glyn but we need our break ! Ha,Ha.Any way just a note for you parents,if you are looking for a soccer school to send your children on i definitely recomend Elite Soccer. "We have had two excellent football birthday parties with Elite Soccer, both my boys absolutely loved them. The birthday boy was made to feel very special and was awarded a trophy at the end which each son still reveres. It's a great, fun way to celebrate a birthday and entertain 20 young boys and girls, it certainly is an energetic way to build up their appetites ready for all that party food. Many thanks Glyn - I'm sure you'll be hearing from me again later in the year nearer Den & Paddy's birthdays." Hi what a great soccer school you run great value for money keep up the graet work Glyn.
" I would like to thank you for coming to my daughters school and running the after school football club, she thoroughy enjoyed it and had great fun showing me all her new skills. Please could you let me know when the next after school club will be starting as she is very keen. Many thanks." "We booked Elite Soccer for our son Danny's 6th birthday party. Glyn's colleague Anthony ran it for us at Clayfield Copse in Emmer Green. All the arrangements went very smoothly, Anthony was excellent with the children, and organised a series of games - most of which were outside the normal 'football coaching' drills, and more aimed at the children playing football for fun. 'The Prisoner' (I think it was called) was a particular favourite! Thanks again." "I would like to say that as working parents we find your soccer school a god send to both Conor & Ellis in the school holidays. 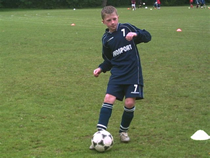 There's not enough football training schools available in our area that offer the versatile training that you offer. When I leave my boys, I know that they will enjoy their day, learn something new about football and be in a safe and friendly environment." What a fantastic party you provided on sunday,so many fun games,compertions it was great my child has had a few simlar parties but yours was by far the best and great value for money,i have had 4 parents on the phone already asking for your details ,hope you dont mind me giving them out,i think you will get alot of buisness with the great party you provided. "Sophie and Sam thoroughly enjoy the holiday clubs and have been to many of your Elite Soccer parties. Sophie recently had her birthday party with you and had 20 girls and 4 boys entertained and worn out - it’s not just for the boys! Sophie loved her trophy at the end. She also really enjoyed your after school multi-sports club and they all love their medals at the end of the course. Sam commented that he should quit swimming so he can go to your multi-sports club too!! Thanks so much for all your hard work. Keep up the good work Elite Soccer School! See you in the summer holidays." Glyn i would just like to say that my 2 sons had a great time on your soccer school each day they came back showing me new skill they had learnt on the course and were up at the crack of dawn each day looking forward to the course, i must say that you run a proffesional friendly set up which is great value for money and the boys are already looking forward to your next course! Hello Glyn i would just like this oppertunity to thank you for running such a great course at Helen's school she really enjoyed it could you let me know if you are running it again next term. Hi just thought i would send you this e mail as i would like to let all the parents know what a fantastic time my two children had on your holiday course and a week later they are still talking about what a great time they had we also had a birthday party with you last year which again was fantastic Joe's birthday is coming around again and has made his mind up he would like the same party this year thanks again Glyn. "many thanks for making my son's Rugby birthday party such a success with a great session of Rugby games and tournaments for him and his friends. Your rugby trainer was great and was enjoying himself so much he even stayed for longer than he was booked! We will most certainly be using you again next year"
What a great course you ran in the holidays my boys are already talking about the next one thanks to you and your team. My daughter has attended your street dance course and she loved it and the preformance at the end was fab! Dont no how you controled all those kids i thought the party was well organised and great value for money.my son really enjoyed the hockey part well done! Hi i would just like to say what an excellent time my 3 children had on your course ,two week on and they are still talking about it and are begging me to sign them up for your next course!Also i would like to say what value for money it was as i had 3 children attending you gave me a family discount which made the already value for money course even more value for money i will be recomending you to all my friends. Thanks for doing Luke's 7th birthday party for us on Sunday. He had a fabulous time and all his friends said how much they enjoyed it. It was very well run and the children were engaged throughout - even the ones that aren't particularly sporty joined in and had lots of fun. I would have no hesitation in recommending an Elite Soccer party and am sure we'll be calling on your services again in the future.